Police have conducted a search of pop star Michael Jackson's Neverland ranch. Officers used a warrant to enter the 45-year-old singer's home in the Santa Ynez Valley, in California. The pop star's lawyer, Brian Oxman, said the search was connected to sexual abuse allegations brought by a 12-year-old boy. But Michael Jackson's publicist later said the singer - who was not at home - had no idea what the search was about, and promised full co-operation. Authorities in Santa Barbara did not give reasons for the search, saying only it was part of a criminal investigation. 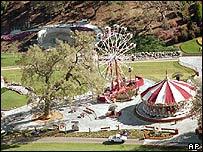 "At 8.30 am (1630GMT) Santa Barbara sheriff's department and district attorney's office investigators executed a search warrant at the Neverland Ranch in connection with a criminal matter," said sheriff's commander Jeff Meyer. But Mr Oxman said it involved an allegation of sexual molestation. "The search warrant indicates there is an accusation by a 12-year-old boy who says that he was molested and the police are seizing information which they think in relevant to that accusation," he said. "We cannot comment on law enforcement's investigation because we do not yet know what it is about. Michael will, as always, co-operate fully with authorities in any investigation even as it is conducted, yet again, while he is not home," Mr Backerman said. In recent years, Jackson has been involved in a string of controversies. 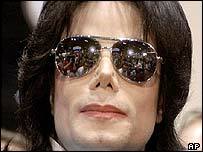 Michael Jackson had international hits with the albums Thriller (1982), Bad (1987) and Dangerous (1991), but his career has subsequently waned. "He's promised to help the investigation any way he can"